"Restore Dirty and mouldy Grout back to its original White colour"
After tile Grout Reviver is guaranteed to stop mould, mildew and bacterial growth. Anti-Mould Steritouch actively prevents the growth of bacteria, mildew and black mould that are commonly found in areas of high humidity such as bathrooms and kitchens. After Tile White Grout Reviver is certified to show no mould growth after more than 10 Years. Dries to a white finish. Contains Steritouch to prevents mould growth. Apply straight from the tube using the inbuilt applicator pad. Surfaces must be clean, dry; dust free and sound. Remove any old mould prior to application and allow to dry. and re-grouting; then allowing to dry. may not be compatible with this product. 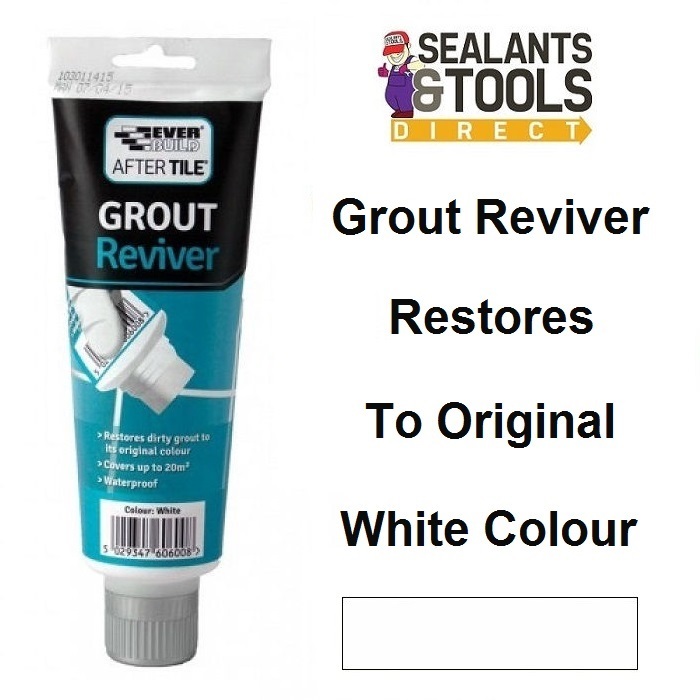 "If After Tile Grout Reviver discolors or stains due to mould growth within 10 years of application simply return pack or receipt of purchase to Everbuild and we will refund you purchase and postage costs. however it is not a substitute for regular cleaning as excessive deposits of soap can cause secondary mould growth. Nothing in this statement does or will affect your statutory rights."